This piece of Rahan fanart is dedicated to dawn-refia who is celebrating her birthday today. So, dawn-refia, I hope you have a most blessed birthday and even if you don’t know where this piece of fanart originated from I still hope you are able to enjoy my gift to you. So, I got myself interested in a French-Italian cartoon by Xilam, the same company that made the likes of Oggy and the Cockroaches. What cartoon was that you ask? It was none other than Rahan: Son of the Dark Age. I only knew about the original source material by Roger Lecureux in passing but have only read bits and pieces of it online and I found it kind of fascinating mostly because I do like stories of primitive tribes and action fantasies akin to Tarzan and Conan. So, as I watched some episodes of the Rahan cartoon by Xilam, there were some characters I grew to love and those were Rahan, Enok, Noama, Teyta, Bakur, Chief Moko, and to some extent Ursus, even though I did find him annoying on some occasions. Based on my experience on watching episode 2, I have to say that this made me ship Enok and Rahan as an awesome BroTP given their chemistry. Heck, I almost rooted for Enok to ditch his father and his tribe to be with Rahan and Ursus, to start his life anew, and admit that it was really dumb of him to steal the Cave Dwellers’ idol. However, it was not meant to be, which made me feel sad inside because I was rooting for Enok and Rahan to be best friends forever and be allies. In the show, Enok was about 18 years old and Rahan was about 16 or 17 years old. I decided to age them up to what I think they would look like this year with Enok being 28 years old and Rahan being 27 years old. Moreover, I transported them to the modern times where both Enok and Rahan are MMA fighters, who have gained acclaim not only in their native France but also internationally. 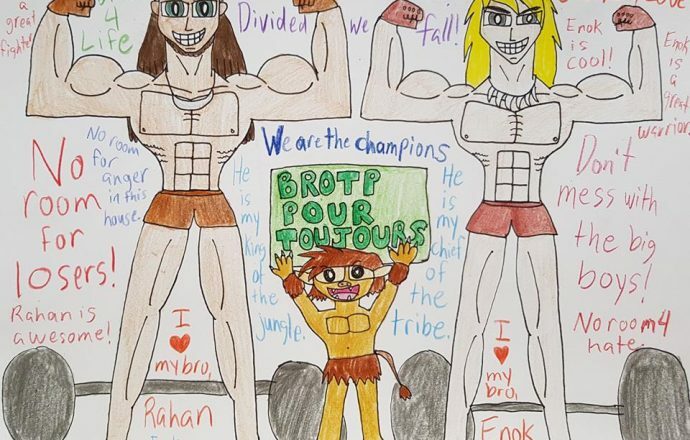 I also threw in Ursus for good measure, as he functions as the mascot, and he is holding up a sign that says translated from French to English, “BroTP forever”. I don’t know if there is a French equivalent to BroTP, so please French native speakers and Francophones comment what it is. In my headcanon, when Enok was a teenager he became so fed up with his father’s and his clan’s tight hold on him that he decided to ditch them. Moreover, he decided to swallow his pride and be with the one person he loved as a friend and a brother, Rahan. Rahan was initially hesitant with having Enok around due to his trust issues and how he does not like it when Enok acts rashly and pridefully. After some time, Enok and Rahan decided to bury the hatchet and accept each other as brothers much to the joy of Ursus. In addition to that, after much reflecting, Moko decided to let go of his hatred and animosity and accept Rahan as his younger adopted son, as he understood that Rahan himself led a life as an orphan. Given their passion for self-defense and martial arts, Enok and Rahan enrolled themselves in Muay Thai, MMA, kickboxing, boxing, and wrestling sessions. Day by day, the two men have trained their bodies and minds to reach peak physical performance. From swimming to weightlifting to doing track and field to all the beatdowns they had, there was a sense of mutual fraternal love and respect they had for each other. Moreover, they even made new friends and had new mentors along the way from all over the world. To this day, the two are still proud to call themselves brothers and are happily married, Enok ended up with Teyta and Rahan ended up with Noama. Ursus stayed around to be the official mascot of the two-man MMA team Enok and Rahan made and therefore christened this team as The Jungle Chiefs. Well, I hope you enjoyed this post, especially to all of you fans of the Rahan cartoon series by Xilam. And to dawn-refia, lot’s of love on your very special day. 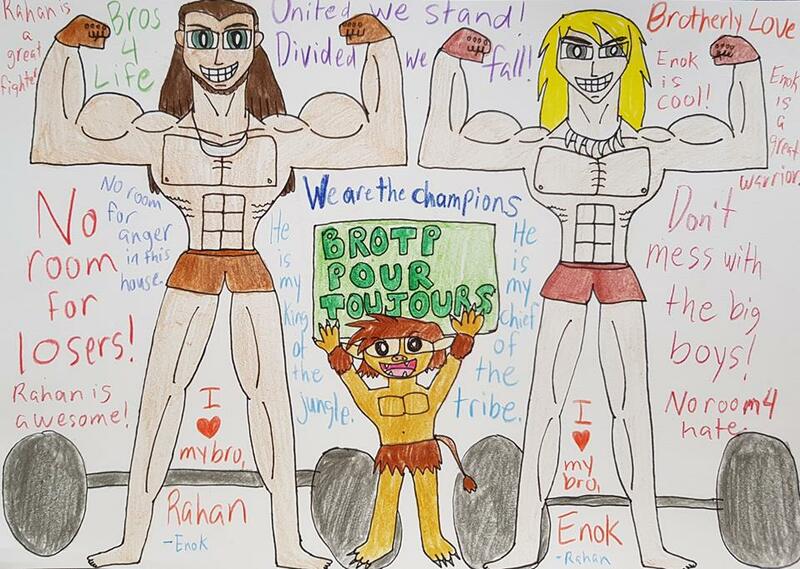 Enok, Rahan, and Ursus from Rahan: Son of the Dark Age belong to Roger Lecureux, Pascal Morelli, Marc du Pontavice, and Xilam.